I love a good lassi. Especially in the summer when the weather is warm. Last year we were hooked on this Simple Sweet Lassi. This year, it’s a Blueberry Lassi! Why you might ask? 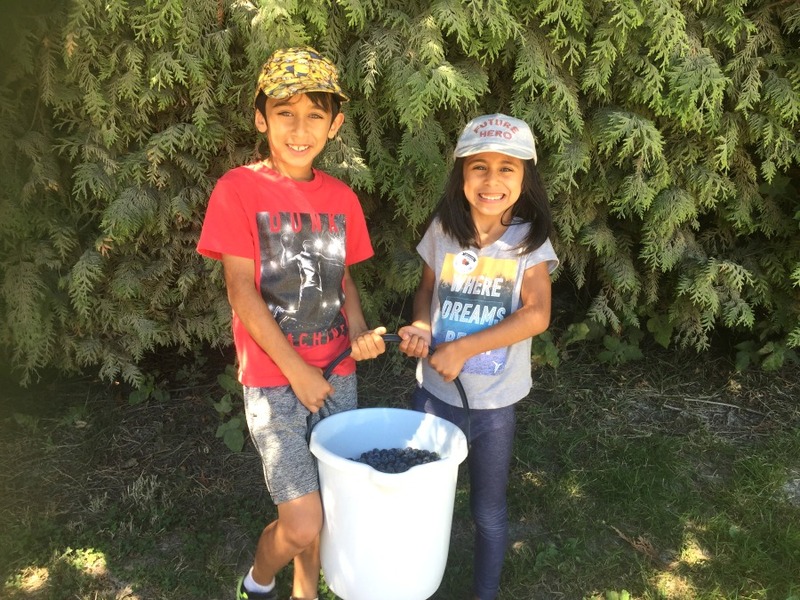 Well, last week, the kids and I did a blueberry U-Pick trip at Emmy Lea Farms. 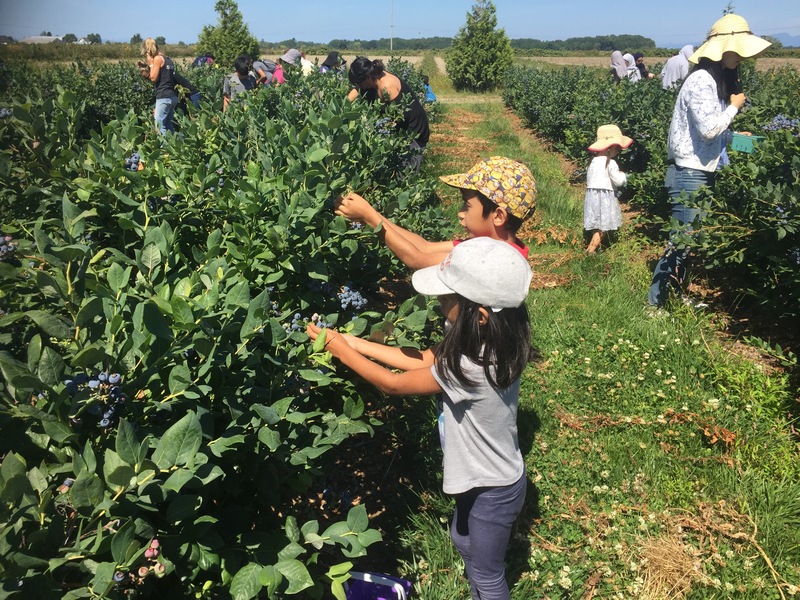 Not only did we have so much fun picking BC Blueberries straight from the bush, it was great to be able to support local farmers and eat local produce. BC Blueberries are just so sweet that we ate a lot of them on the car ride back. Once we got home, we used them in pancakes, smoothies and crepes. 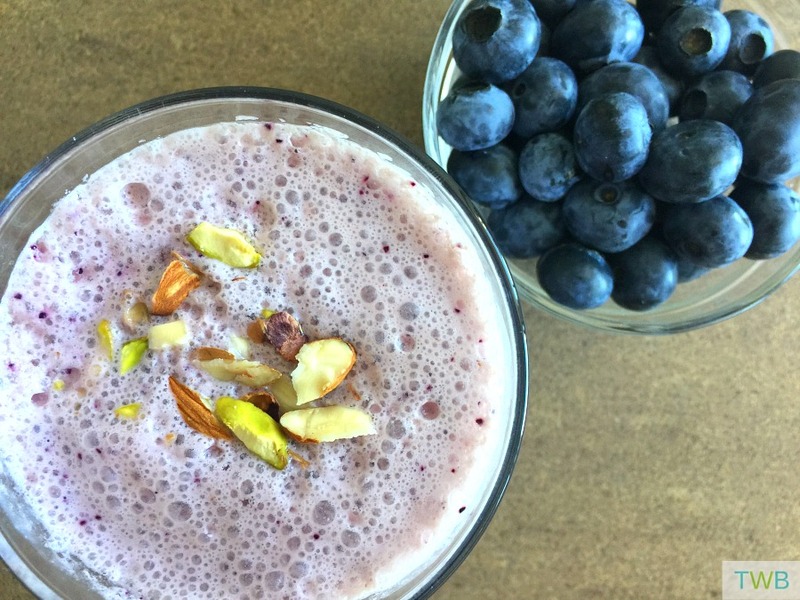 But I was also itching to try a new recipe and what came out of it was this super easy and super yummy Blueberry Lassi. 1. put all the ingredients, except the garnishes, in the blender. Blend until completely smooth. 2. Pour into two glasses. Garnish with the nuts and saffron if you want. (I love the extra flavour they give!) Then enjoy! 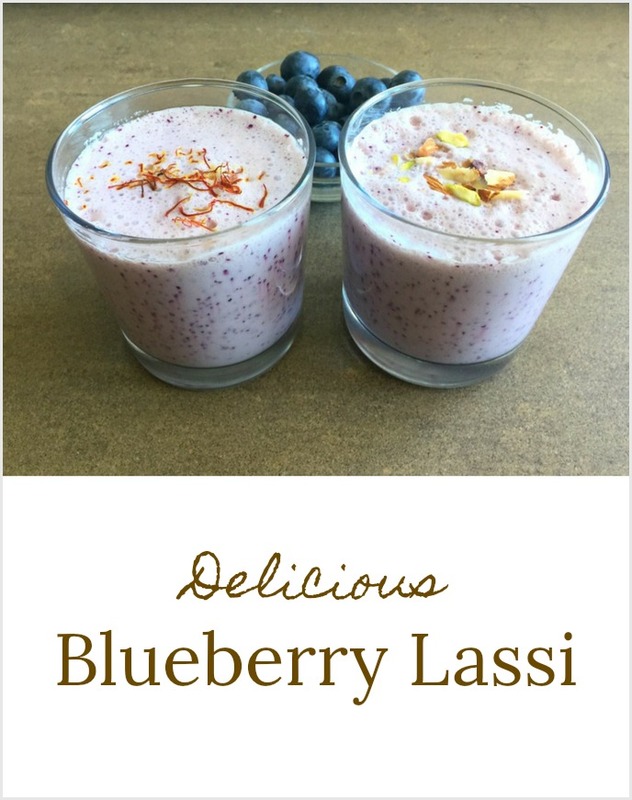 I wasn’t sure how it would turn out when I was first putting the recipe together, but the Blueberry Lassi was so delicious. I used my neighbour, my dad and my eight-year old son as testers and all three of them loved it! I was really happy about that because not only are blueberries tasty (they aren’t called nature’s candy for no reason,) they are also really healthy for you. Blueberries are full of antioxidants, low in calories, and high in vitamins C, A and E, and dietary fibre. Eating just one cup of BC blueberries every day can help prevent and treat diabetes, heart disease, stroke, Alzheimer’s and Parkinson’s disease. That’s a lot for one little berry! If you haven’t had a chance to u-pick BC Blueberries this season, here’s a list of farms you can visit. If you don’t have time to pick them yourselves, you can just pick up a box at the farm closest to you or the local grocery store. 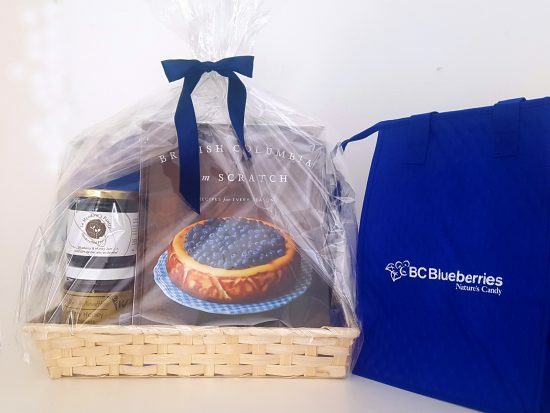 BC Blueberries also has a great giveaway for you! They are giveaway away two amazing gift baskets that are each valued at $250. Follow the instructions on the rafflecopter below to enter to win. Contest ends August 28, 2017 and is open to BC residents. * This post was sponsored by BC Blueberries. All opinions are my own. a refreshing lassi is definitely a MUST for summer..i have only tried plain and mango ones but now i want to make a different version. We tend to use them to make a pie! I love to put blueberries in my morning smoothies! Blueberries are my favourite!! I mostly love to eat them fresh, but I also love to put them in our homemade banana muffins, as well as in blueberry pie (I just wish I could make a better crust like my Grandma used to!!). And my mom makes the most delicious blueberry/banana pie that I need to get the recipe for – it’s my all-time favourite dessert! Blueberry cobbler is one of my more favourite recipes to use blueberries in. I use buttermilk instead of regular & honey for sweetener…so delicious. Then top with vanilla ice-cream and you have a scrumptious dessert. 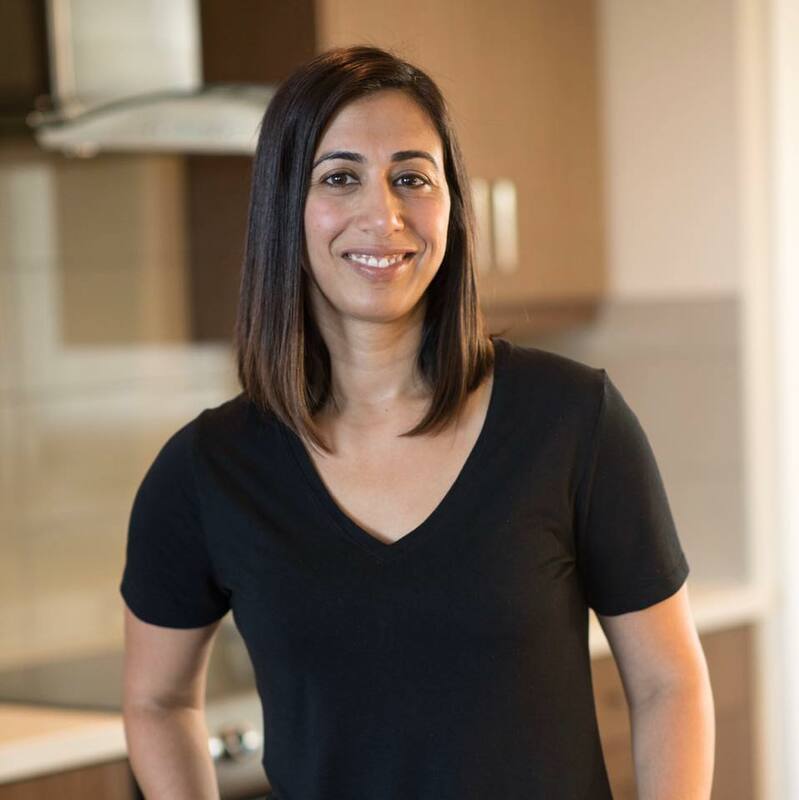 generally, we just rinse and eat….or sometimes have on vanilla yogurt or ice cream. I love making Blueberry Crisp, I love it because it’s great with fresh or frozen blueberries and you can add any other fruit you have to it! Blueberry smoothie each and every morning- I will certainly be trying this blueberry lassi, especially after getting a bunch of saffron from my Spanish exchange student! My favourite recipe to use blueberries in is Blueberry Cheesecake where they are gently stirred in. It’s berry delicious! My little one is too young to cook but treats this momma to breakfast in bed with a kid-made parfait including yogurt and fresh blueberries topped with mint and served in my wine glasses. This looks so refreshing for the summer! Can’t wait to try and loved that the kiddos helped too! p.s. 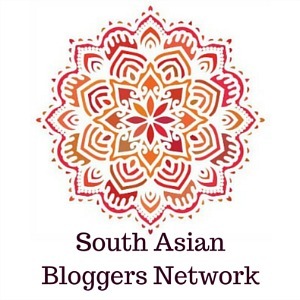 The lassi sounds so refreshing! omg!!! such a unique addition for a classic lassi! Blueberry waffles/pancakes, and blueberry smoothies! Lemon blueberry coffee cake or loaf. Reminds me of tea with my mom. I love making Blueberry muffins with crusty tops! I love doing pancakes – swift and easy. I wish I had more time to bake though! Blueberries are my all time favorite summer fruit. Best fresh, or in pies, pancakes, sauces, on ice cream….. I would totally eat this with a spoon! Never thought of adding turmeric. Sounds yummy!